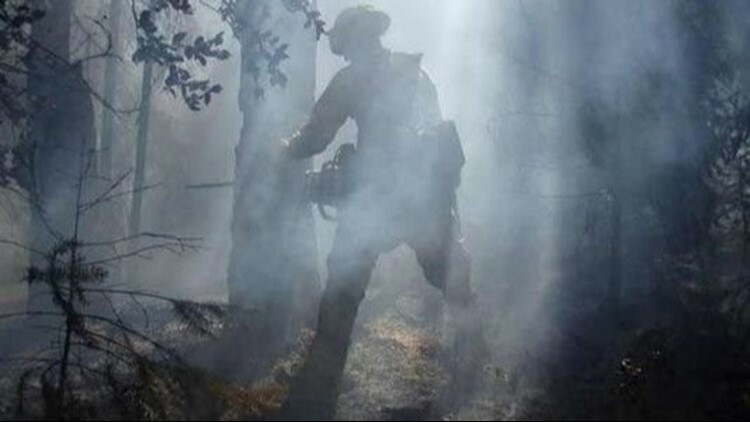 File image of a firefighter working a wildfire in the Boise National Forest. Strong winds and poor visibility created challenges for firefighters working the blazes on Saturday. IDAHO CITY - Firefighters are working to get a handle on several wildfires that sparked during a lightning storm on Thursday night. Strong winds and poor visibility created challenges for firefighters working the blazes on Saturday, the Boise National Forest said. As of Sunday, three of the new fires were still burning in the forest. The largest of the three is the 45-acre Casner Fire, located about two miles west of the Warm Springs Airstrip. Fire officials say more than 100 firefighters and helicopter crews are working to secure a perimeter line in steep terrain. The German Fire is about 30 acres in size and 20 percent contained. More than 90 firefighters are working the fire, which is located about nine east of Idaho City. At seven acres, the Wren Fire is the smallest of the three new fires. Officials say the fire, which is located 17 miles east and northeast of Idaho City, is 50 percent contained. Crews expect to have it fully contained on Sunday. Fire officials say Thursday's lightning storm prompted a quick response from multiple agencies. There are currently no road or area closures in place for the new fire starts, however the Wapiti Fire area closure near Grandjean remains in effect. Stage 1 fire restrictions remain in effect for the Boise National Forest.